OneLogin can sign users into applications using various mechanisms, of which the most robust and secure is SAML. SAML works in all browsers, but unfortunately not all applications support SAML. As an alternative, OneLogin can use "form-based authentication" to inject user credentials into an application's login page to log the user in. Sometimes this can be done with a simple HTTP POST, but there are cases when OneLogin's browser extension is required. Note. Like most cloud vendors, OneLogin is deprecating support for TLS 1.0. To support browsers that use TLS 1.1 and 1.2, you may need to upgrade your browser extension. For more information, see Disabling TLS 1.0 Support. What do browser extensions do? Signs users into apps that don't support SAML or simple HTTP credential POSTs. Provides a OneLogin shortcut icon in the toolbar that gives users a quick and easy way to bring up OneLogin's portal and gives users a drop-down list of all of their SSO apps (drop-down not available in Internet Explorer). 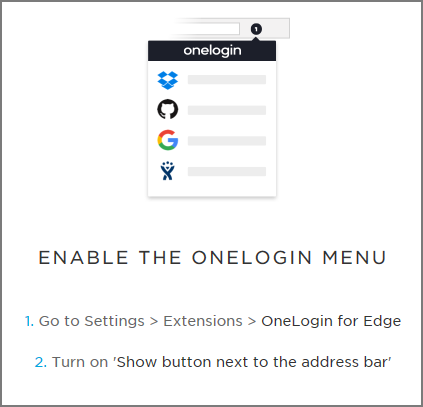 Triggers OneLogin's login pop-up when a user goes directly to an application's login page, enabling them to choose whether to log in using OneLogin SSO or not. 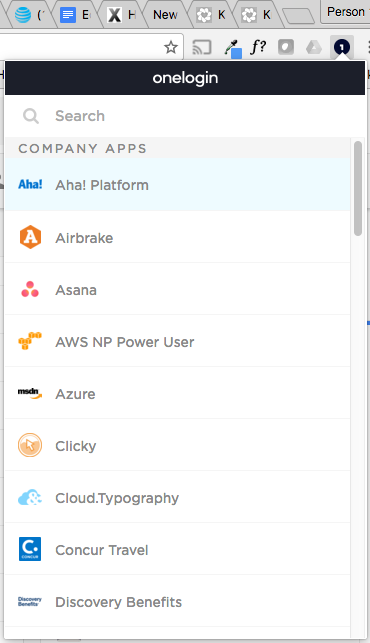 Prompts users to add form-authenticated apps to their personal or company app catalog, providing an easy way to add apps for the whole organization. Signs users into apps that use Basic Authentication (where the login form is part of the browser and not the HTML page). Not available for Safari. The browser extension communicates with OneLogin over a secure connection and does not store any passwords locally on a user's computer. This means that you can safely install the extension on any computer. As soon as you are signed out of OneLogin, the browser extension stops signing users in. Just click your name in the upper-right corner of the OneLogin toolbar, and select Profile from the drop-down menu. The Profile page shows the browser extension download link for the browser you are currently using. Note. Admins can remove the browser extension download link from their user's Profile pages. See "For admins: enabling and disabling the browser extension download link on User Profile pages." For each extension, we provide the most straightforward installation process below. Note: To view all supported browser versions, please see Supported Platforms and Browsers. You'll be prompted to install the extension the first time you try to access a form-based web app using OneLogin SSO. If you don't want to wait for that to happen, you can install the extension using the following instructions. To upgrade the extension when OneLogin releases new versions, you don't have to do anything. The upgrade will be applied automatically when you restart your browser. 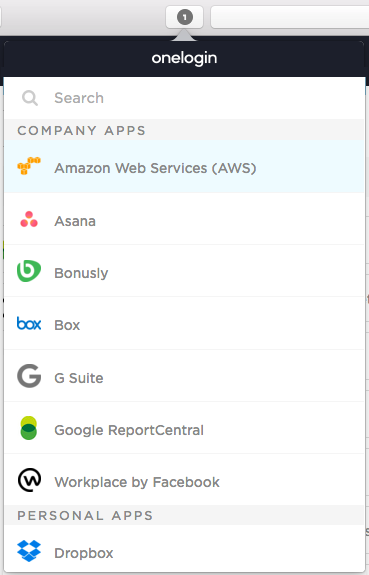 Click the OneLogin icon in the browser toolbar to display a drop-down menu of all of your OneLogin SSO apps. 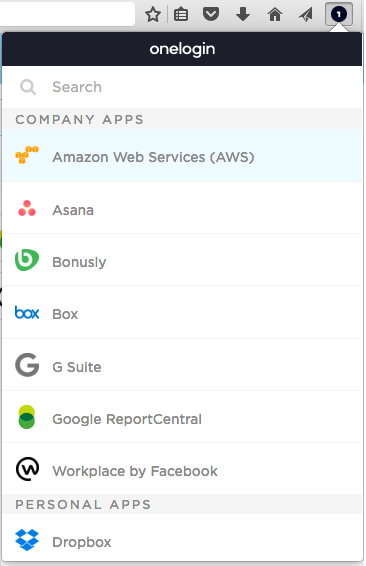 Click on any app in the list to launch it using OneLogin SSO. 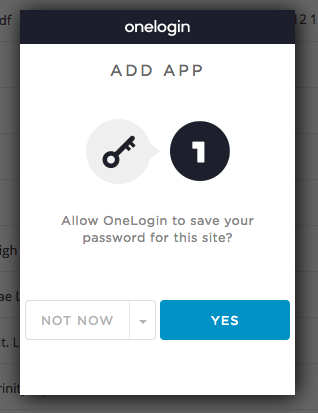 Add an app to your OneLogin dashboard using the Add App dialog. If you see this dialog on a web page, it’s because OneLogin has detected a login page for an app that you don't have in your OneLogin portal. For more information, see Adding Apps using the Browser Extension. Once you have upgraded to version 3.x of the extension by performing this installation, you will get all subsequent updates automatically. Note. OneLogin is deprecating support for TLS 1.0. To support browsers that use TLS 1.1 and 1.2, you must upgrade to OneLogin Browser Extension for Internet Explorer 2.0.27 or above. This version of the browser extension requires .NET Framework 4.5 or above. Most modern Windows operating systems have .NET Framework 4.5 or above installed by default. However, if you are on Windows 7, you may need to upgrade.For more information, see "Required Update for Windows 7 users with OneLogin Browser Extension for Internet Explorer" in Disabling TLS 1.0 Support. Click the DOWNLOAD button under Internet Explorer Browser Extension. 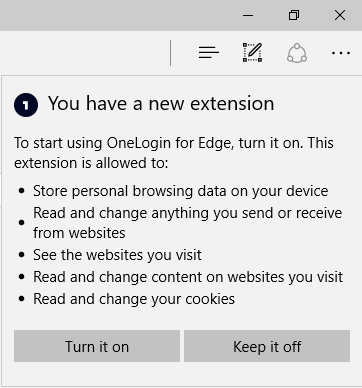 To upgrade the extension when OneLogin releases new versions, just reinstall it using the above instructions. 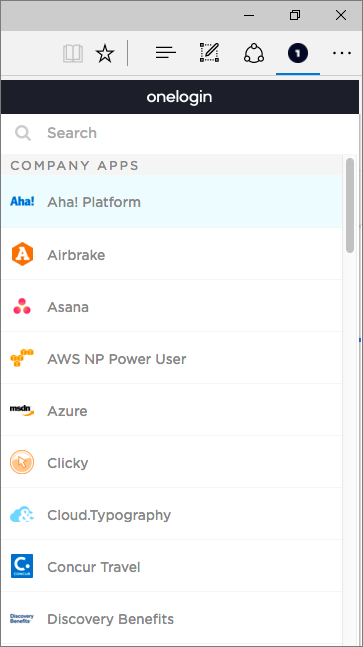 Click the OneLogin icon in the browser toolbar to load your OneLogin dashboard, where you can launch apps. If the dashboard is already open in another tab, focus will be switched to that tab. 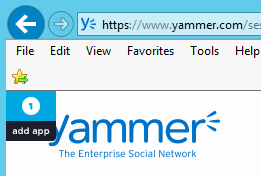 In Internet Explorer, the OneLogin icon is sometimes hidden, and you have to click the double-arrow to the right of the toolbar to see it. You probably want to customize your toolbar and move the icon to a location where you can always see it. Add an app to your OneLogin dashboard by clicking the add app button. If you see this button on a web page, it’s because OneLogin has detected a login page for an app that you don't have in your OneLogin dashboard. When you click the button, OneLogin checks if this is a pre-integrated app and then adds it to your account. If the app is not yet supported, you can create a custom connector using OneLogin’s connector wizard. 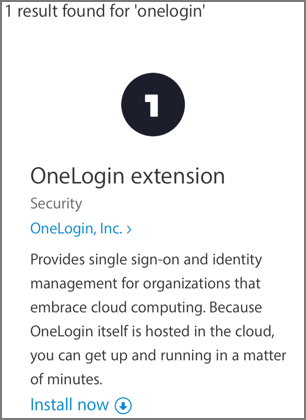 You'll be prompted to install the extension the first time you try to access a form-based web app using OneLogin SSO. 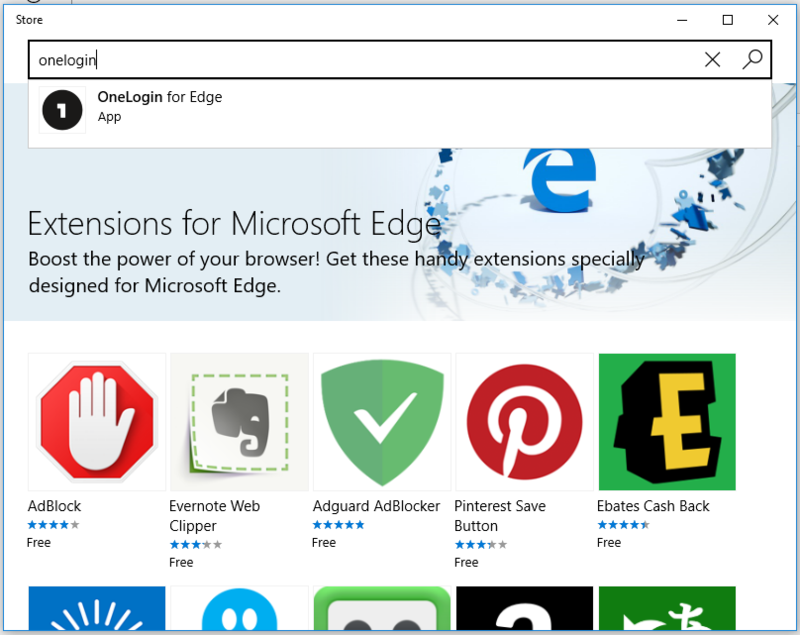 If you don't want to wait for that to happen, you can install the extension from the Windows Store. Note. The Safari extension does not support basic authentication (where the login form is part of the browser and not the HTML page). Note. 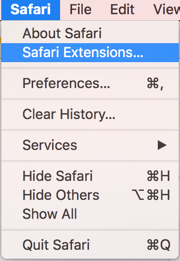 If you are upgrading an existing installation of the OneLogin Browser Extension for Safari and you choose to get the Safari extension as a downloaded file from your Profile page instead of the Safari Extensions Gallery, you may see the error message, Safari can't install this extensions. 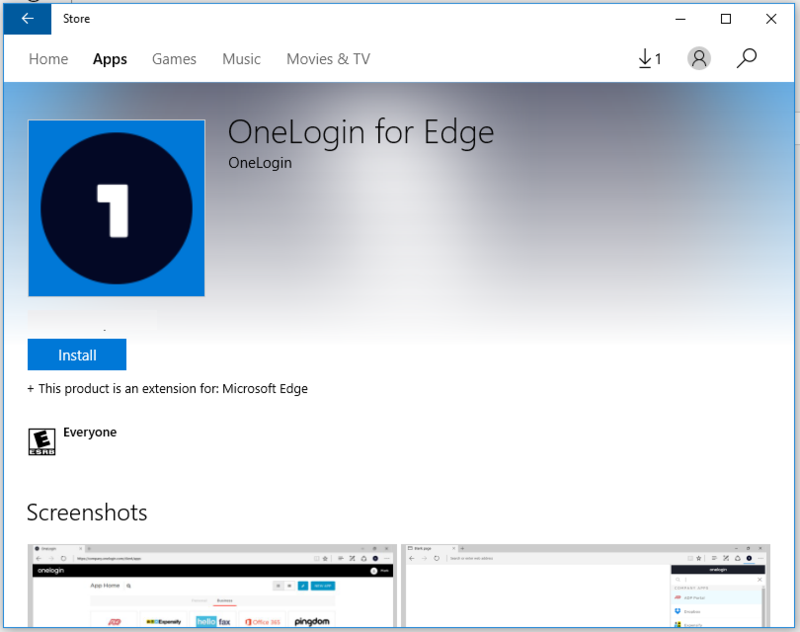 An error occurred while installing the extension "OneLogin extension." This indicates that you originally installed the extension from the Safari Extensions Gallery. In this case, Apple doesn't "trust" the downloaded extension installer file because it expects you to update from the Extensions Gallery. 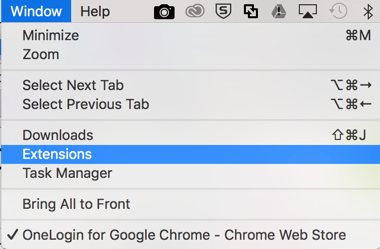 Simply uninstall your extension: go to Safari > Preferences > Extensions, select the OneLogin extension, and click the Uninstall button. Then you'll be able to install the latest version of the extension from your Profile page. You can enable your users' Profile pages to display the browser extension download link for the browser they are currently using. As an admin, you can use security policies to add and remove these links from your users' Profile pages. Usually, you should enable these links. But you may want to remove them if your organization doesn't use form-based apps and you don't want your users to add personal apps. And because you enable the link using security policies, you can show the link to some users and hide it from others. Important! If you use any apps that use form-based authentication, or if you want your users to be able to add personal apps, we recommend that you enable the browser extension link on your users' Profile pages. Note. If you created a policy before October 19, 2016, when we released the ability to enable and disable extension download links, this feature is enabled by default. If you created a policy after that date, the download link option is turned off by default, and you must enable it. As an admin, go to Settings > Policies. Select a user security policy to modify from the list or click the New User Policy button to create a new one. Scroll to the Browser Extension section and clear the Enable checkbox to disable the link or select it to enable the link. Note that this checkbox is disabled by default for new user security policies, but is enabled by default for all user security policies that existed at the time that this feature was released (October 19, 2016).